You can taste Sogen, Sogen Sake Brewery Co.,Ltd. from Ishikawa prefecture, and Izumibashi, Izumibashi Sake Brewery Co., Ltd. from Kanagawa prefecture. Izumibashi sake brewery is in Ebina city in Kanagawa prefecture. It was founded in 1857. Kanagawa is adjacent to Tokyo, and gets a lot of tourist traffic owning to its landmarks – Yokohama and Hakone. Surrounding the brewery are rice fields. Many of those fields are cultivated by Izumibashi itself. In 1996, the brewery began growing its own rice. Now, they cultivate over 40 hectares of rice fields – a mixture of own and rented land. Izumibashi sake brewery puts an emphasis on natural farming methods. While not going 100% organic, Izumibashi grows rice with minimal use of agrichemicals. Using natural methods to increase vitality and strength of plants, it grows rice that is naturally pest-resistant. Izumibashi has been able to reduce the use of agrichemicals by 96-100% of the existing prefecture standard. The brewery also works with the local Sake Rice Association to re-cultivate unused land and promote natural farming methods. As a result, all farmers they work with have reduced the use of　agrochemicals to 60% of allowable level. The red dragonfly, the symbol of Izumibashi, likes rice fields. Izumibashi believes that it has seen the increase in dragonfly numbers – a result of using less chemicals. A nice sort of symmetry in that, don’t you think? Izumibashi sake brewers also mill the rice they use in their sake. While a few brewers do that, the majority outsource this task. Izumibashi’s staff assess the quality of rice that comes to the brewery, which can differ by strain, origin and even the weather of each summer, and polish the rice according to their findings. From growing to polishing, rice gets a lot of attention at Izumibashi! Izumibashi only brews junmai sake, which means the brewers do not add any distilled alcohol to sake at any stage. While addition of a small amount of alcohol at the end of the brewing process is a valid technical step in sake brewing (it helps draw out alcohol-soluble flavours), a small number of breweries believe that it can be avoided with enough effort and skill. You can taste Rihaku, Rihaku Shuzo from Shimane prefecture, and Fukuju, KOBE SHU-SHIN-KAN BREWERIES,LTD from Hyogo prefecture. Shimane is part of the Chugoku Region, along with four other prefectures (Tottori, Okayama, Hiroshima, and Yamaguchi). Shimane can be considered to be the birthplace of sake for its long and important history, which dates back to the time of mythology. Myths and records remain to tell us the deep connections between Shimane and sake. For example, Saka Shrine in the Izumo region enshrines a deity of sake brewery. The annual gathering of all of the deities of Japan so that they may hold meetings in Izumo is a widely known part of the folklore. After the meetings, most of the deities went back to their enshrined places, but some deities found sake so delicious that they stayed there and enjoyed sake for another six months. The place where they stayed and drank sake is believed to be the origin of Saka Shrine. The shrine is one of the very rare shrines where is allowed to brewer sake. In October, one month ahead to the brewing season, an important ritual takes place at Saka Shrine and people related to sake brewery pay a visit hoping they can make good sake for the upcoming season. Rihaku Shuzo was founded in 1882 in Matsue City in Shimane, although it was not until 1928 that we adopted the name Rihaku. Rihaku was a famous poet in China, and is also known in English as Li Po. He is as important in Chinese literary history as Shakespeare is to people in Britain. Rihaku lived from 701 to 762, and was heavy drinker. He was a kind, open-minded, wandering poet that was famous for drinking a lot before writing. He was known to have said, “I drink a bottle, and can write 100 poems.” They make use of Rihaku’s poems and phrases in their brochures and on their labels, and quote him often. Several of their sakes are named with phrases from the great poet’s words. One of the most renowned sake brewery areas in Japan,”Nadagogo.” The Fukuju brewery is located in there. Founded in 1751. Considered one of Japan’s best sake-brewing areas, this coastal cluster of towns located around 12 kilometers from Kobe City and Nishinomiya City includes Nishigo, Mikagego, and Uosakigo. It is said that breweries began producing sake around 1330. You can take a walk through the heart of the brewing area down Sake Brewery Street, which is home to many independent museums that shed light on the sake production process. Fukuju brewery offers tours and samples of their wares. 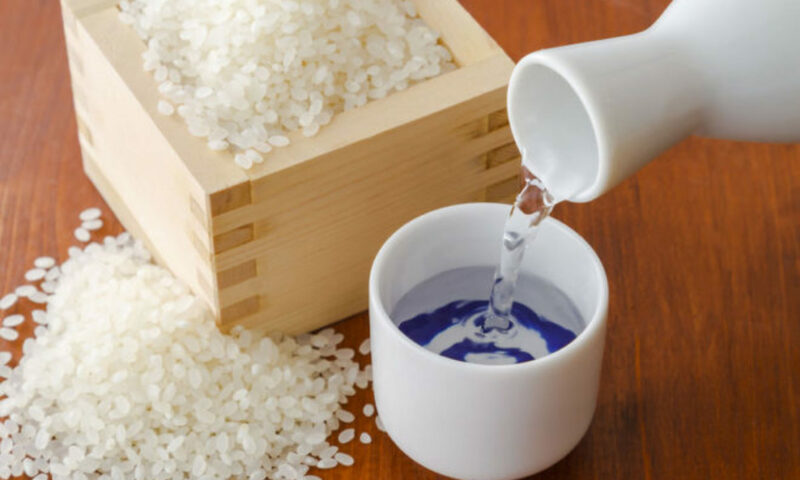 The best sake rice and source water are brewed carefully. Because of the high quality sake from Nada was already famous during the shogun period. The water is rich in minerals and generates a clear and powerful sake profile. Therefore sake from Nada is called “Otoko-sake (men’s sake)”. FUKUJU Chotokusen Daigin is awarded SAKE COMPETITION 2018 Ginjo GOLD. Fukuju Junmai Ginjo was served at the dinner and reception for the Japanese scientist who won the Nobel Prize in 2012. Since then it has become ultra popular in Japan and you cannot find it on the shelves anywhere. You can taste Shichiken, Yamanashi meijo co. Ltd., from Yamanashi prefecture, and Sempuku, MIYAKEHONTEN Co., Ltd. from Hiroshima prefecture. Yamanashi meijo was founded in 1750. It is located in Hakushu, Yamanashi. Hakushu is northwest of Yamanashi and has a splendid view of the Southern Alps. It still remains of the original landscape of Japan used to be. Making a long journey through the mountains in the Southern Alps, the clear underground water in Hakushu is soft, sharp in taste and contains the right amount of minerals. Because of this water, in Hakushu, there are not only Yamanashi meijo but also Suntory Hakushu Distillery for whiskey. Emperor Meiji stayed overnight the Yamanashi meijo brewery site, a stately main building in 1880. The building is protection of cultural properties and you can view the historic wooden building still now with Japanese style garden. The “Daigaharajuku” market opens on the third Friday, Saturday, and Sunday of October every year in the area of Yamanashi meijo. Daigaharajuku is famous for its crafts and antiques. In just three days, over 400 years of history exist side by side, 50,000 people come to visit from in and out of Yamanashi. Not only to buy antiques and crafts, you can explore the history and culture of Yamanashi. Miyakehonten, Co., Ltd., which is renowned for its sake brand Sempuku, is located in Kure, Hiroshima. The city used to be served as a Japanese navy base. The company was established in 1856 under the name of Kawachiya, initially specializing in the production of mirin(sweet sake for cooking), shochu (Japanese distilled liquor), and shirozake (sweet white sake) products. In 1902, the company started in the sake brewing business. Early in the Taisho period (1912 – 1926), Asama, a flagship of the training fleets of the then Japanese Imperial Navy, sailed for about 220 days, and it was loaded with the company’s Kuretsuru sake products. Although Asama crossed the equator several times during the long navigation, no deterioration in quality and taste was found in Kuretsuru sake. In recognition of its quality and hardiness, it received quality certification by the Asama. Subsequently, Sempuku products began to be delivered to all navy bases located across Japan, enabling the company to rapidly expand its sales channels throughout the country. By early in the Showa period (1926 – 1989), the company had developed into a leading sake brewer in the country. Since its establishment, Miyakehonten Co., Ltd. has faithfully preserved its company philosophy of “Harmonious union and whole-hearted devotion” from generation to generation. Based on this philosophy, and with the spirit of wa (harmonization) as a basic concept, the company is determined to continue taking on new challenges, striving to bring about sen-no-fuku (Sempuku, meaning “one-thousand good fortunes”) to those who enjoy Sempuku sake. Momiji are Japanese maple leaves that have long been a symbol of Hiroshima. Throughout Hiroshima’s history, they have appeared in traditional paintings and block prints, often depicted with Miyajima’s deer. They are especially popular to view when they look as if they are on fire, bursting with bold autumn gold, yellow and red colors. Sempuku Momiji Ginjo is brewed with Momiji yeast. Rice and water are from Hiroshima. Fruity aroma and smooth acidity taste.